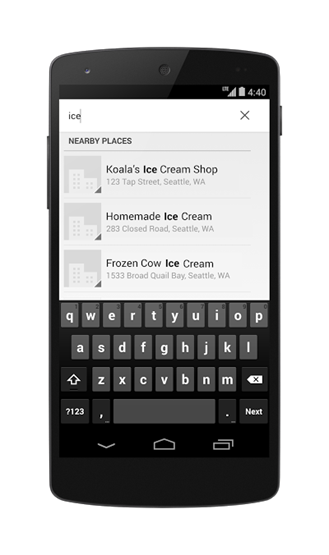 The KitKat dialer will integrate with users of Google Apps for business, matching incoming numbers against contacts and employees (if their phone numbers are shared) in the Apps database. That could be a huge plus for business users who spend more time on their phone than off - it will certainly mean they'll have to manually enter numbers much less frequently. The listings will also work in reverse: you can search for Google Apps contacts or nearby businesses right from the dialer and see relevant results, which you can call with a single tap. But the most exciting addition to the Phone app is yet to come. According to Google's Plus post, personal Google accounts will be integrated into the new caller ID system starting early next year. 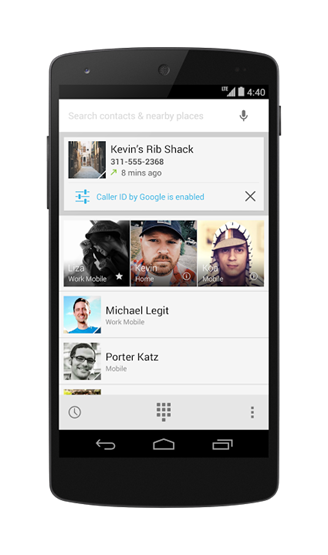 If you use an Android 4.4 phone and an incoming caller has verified his or her phone number on their Google Account (and allowed the discovery feature), their name and profile photo will show up on your phone. Again, I'd like to stress that this feature can be disabled in your Google Account settings page. There have been several apps that have tried to set up this sort of system one user at a time, but with Google's massive database of Gmail and Google+ users (many of whom use their phones as a backup verification device), this could easily be the largest caller ID system on the planet. The yellow/white pages feature is just icing on the cake. Unfortunately, the Google+ post announcing these features heavily implies that they're going to stay exclusive to Android 4.4 and higher.